When it comes to technology, politicians can’t stop making gaffes. 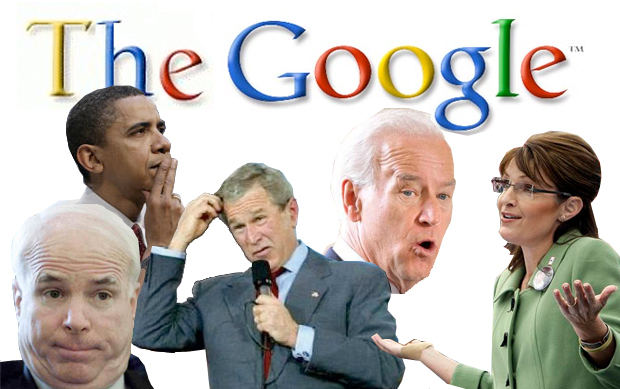 Who would you elect as our most tech-savvy politician? Our tweeter-in-chief Barack Obama? Think again. Arizona senator (and 73-year old senior statesman) John McCain has the highest “Digital IQ” in the Senate according to a new joint study by George Washington University and NYU. John McCain. The guy who can’t remember how many houses he owns. That One. In what GW and NYU are calling the “definitive benchmark for online competence,” researchers combed through politicians’ social media accounts, and calculated their Digital IQ based on the frequency of their YouTube, Twitter, and Facebook use and popularity. If John McCain has the highest Digital IQ, what does that say about the rest of the Senate? Politicians are notorious for their blunders and ignorance of all things tech-related, and this study–while not exactly using the most scientific metrics to determine tech-savviness–may just be a blunder in itself. Here we present our top 10 politico gaffes that show just how low our elected officials’ Digital IQs actually are. 10. Ted Stevens. In 2006, during a committee meeting on net neutrality, the late Alaskan senator Ted Stevens became a Web sensation for his description of the Internet. “The Internet is not something that you just dump something on. It’s not a big truck,” he said. “It’s a series of tubes.” The Internet is “a series of tubes”? And this from the guy in charge of regulating the Net? Stevens quickly became viral fodder for his comments, and gave Jon Stewart material for weeks. 8. George H.W. Bush. Along the 1992 presidential campaign trail, Bush 41 was blown away by a barcode scanner during a grocery store photo-op. The one-term president stared in awe at the machine. “You cross this, this open space?” Bush asked, curiously passing a milk carton through the barcode scanner, as if it were from the future. He said later in the day that he was “amazed by some of the technology” he had seen. 7. Sarah Palin. As more politicians jump on the Twitter bandwagon, it’s getting harder for candidates to maintain polish. Sarah Palin certainly knows this. She recently tweeted, “Ground Zero Mosque supporters: doesn’t it stab you in the heart, as it does ours throughout the heartland? Peaceful Muslims, pls refudiate.” Grammar aside, what the heck does “refudiate” mean? The invented word went viral, especially once discovered she used it again in a television interview. 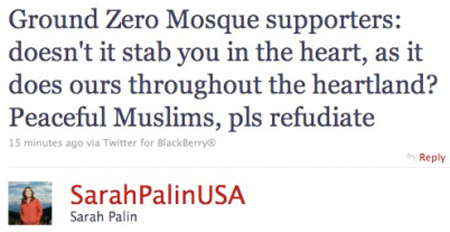 Quickly, Palin deleted the tweet, but followed up with: “English is a living language. Shakespeare liked to coin new words too. Got to celebrate it!” Soon @ShakesPalin–an account devoted to Shakespearian Palinisms–started trending on Twitter. 5. Al Gore. The robotic VP got hammered for his perhaps taken-out-of-context claim that he “invented the Internet.” Wolf Blitzer, who stumbled on the flub during an unrelated interview question, said “it wound up being a devastating setback to him” along the 2000 presidential campaign. 4a. Barack Obama. In all fairness, Bush isn’t the only politico out there adding S’s inappropriately. President Obama has made the same mistake, and it’s perhaps more surprising given his reputation for tech-know-how and social media savvy. Speaking with Russian president Dmitri Medvedev, Obama said: “And during his visit to Silicon Valley this week, he visited the headquarters of Twitters, where he opened his own account. I have one as well, so we may be able to finally throw away those ‘red phones’ that have been sitting around for so long.” The Twitters and the Internets. Aw shucks, don’t we find these mistakes endearing? 3. Joe Biden. In launching the government’s online stimulus spending tracker, the Obama administration was attempting to prove its commitment to transparency. There was just one problem: Joe Biden didn’t know the address, er, whatever you call it. During an interview with CBS, Biden leaned toward an aide, and asked, “Do you know the Web site number?” If only he knew how to dial up the Internets. And this politician has the highest Digital IQ in the Senate?